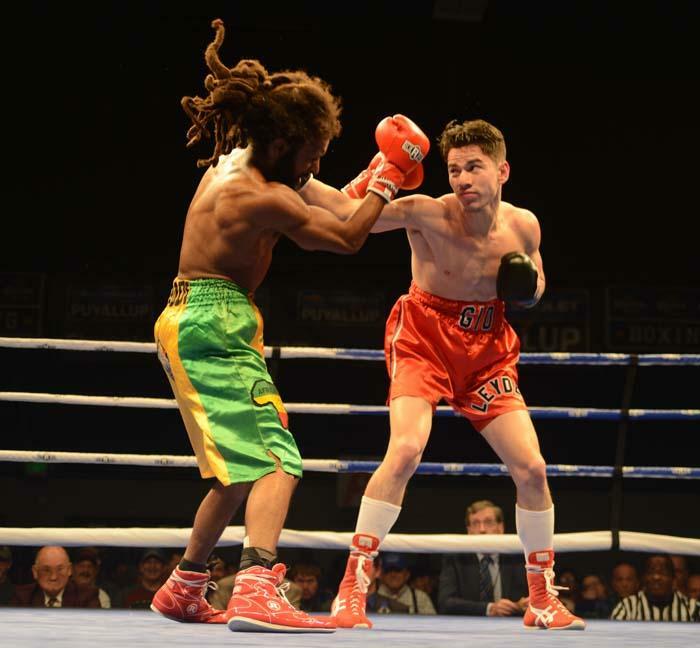 On Saturday night, unbeaten Giovanni Cabrera-Mioletti (14-0 with 5 KO’s) scored an impressive 7th round TKO over previously unbeaten Headley Scott (11-1 with 10 KO’s). 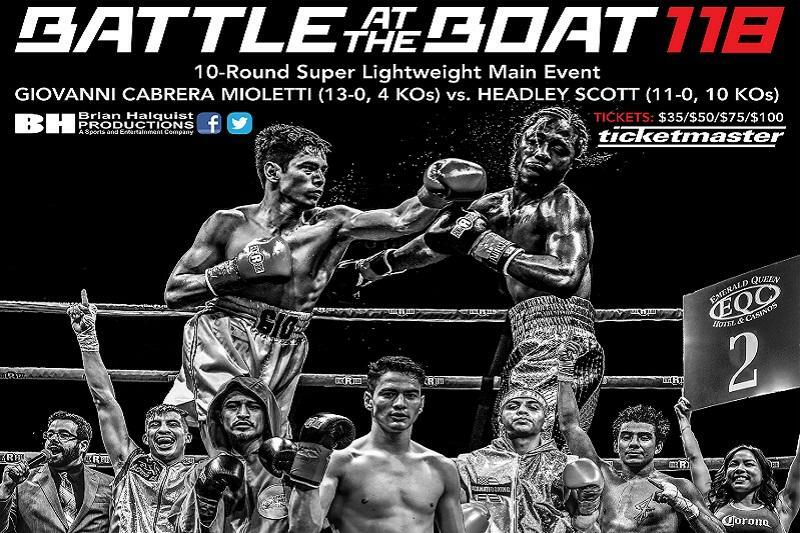 This was the featured main event on Brian Halquist Productions’, “Battle at the Boat 118”, at Tacoma, Washington’s Emerald Queen Casino. This also marks the sixth time, in his short career, Cabrera-Mioletti has scored an impressive win over an undefeated fighter! The scheduled, 10 round, Super Featherweight (130 pounds) bout saw both fighters coming in trim and ready for action. 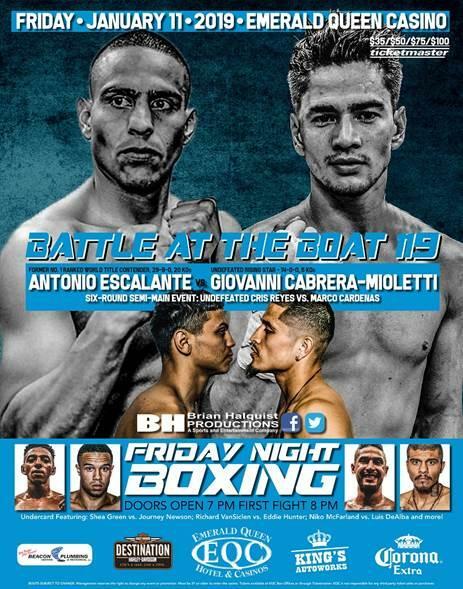 Cabrera-Mioletti tipped the scales at 129.9 while Scott weighed in at an even 130. But from the opening bell, the superior skilled Cabrera-Mioletti dominated the tough, but awkward Scott. For six rounds he battered, cut, and wobbled Scott. In the 7th he backed Scott into the ropes and unloaded a barrage of punches, forcing referee Jeff Macaluso to call an end to the bout at the 2:27 mark. To Headley’s credit, he never gave up and true to his record of 11 wins with 10 by knockout, he tried to turn out Cabrera-Mioletti’s lights right up until the very end. 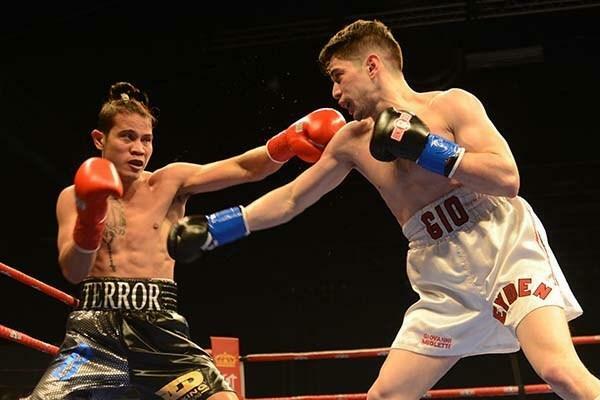 On June 30, 2018 dmboxing.com ran an article about a young undefeated fighter, Giovanni “Gio” Cabrera Mioletti, entitled “12 Questions for a 12 – 0 Fighter”. 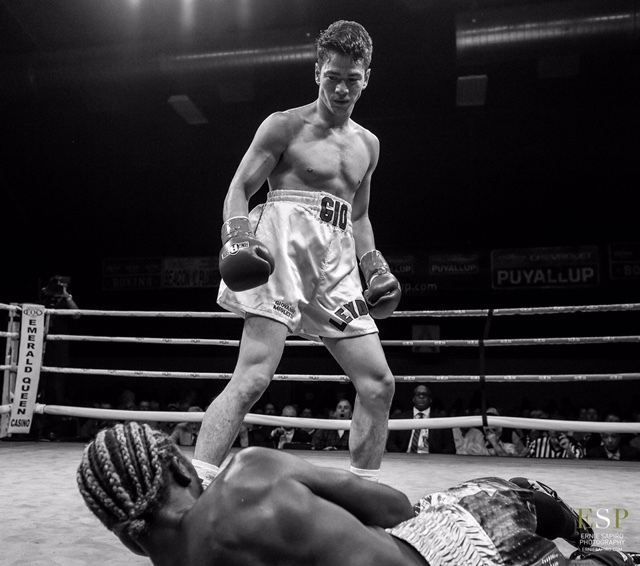 Saturday night, in front of a packed house at the Emerald Queen Casino in Tacoma, Washington, Gio put his 12 – 0 record on the line in a scheduled 10 round Main Event against former WBA Super Featherweight Interim World Title Challenger Carlos Padilla of Colombia. To the delight of those in attendance, Gio put on a boxing clinic before ending the affair and sending Padilla home early. 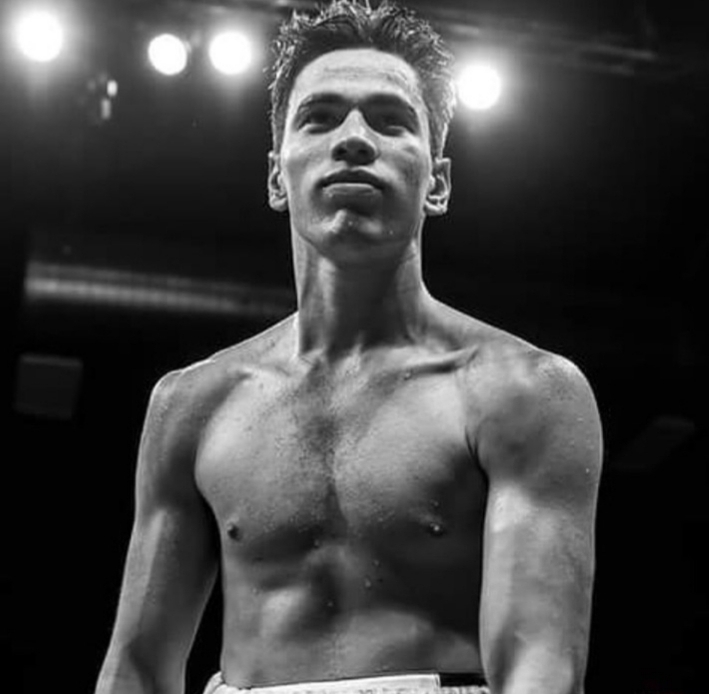 He decisively out boxed his opponent in the first three rounds, then opened up in the fourth, rocking Padilla near the end of the round. Although hurt, Padilla managed to survive the round, but it would take more than a 60 second break for him to recover. After being checked over by the ringside physician, and with no opposition from his corner, the Doc pulled the plug, keeping Padilla from coming out for the 5th round. 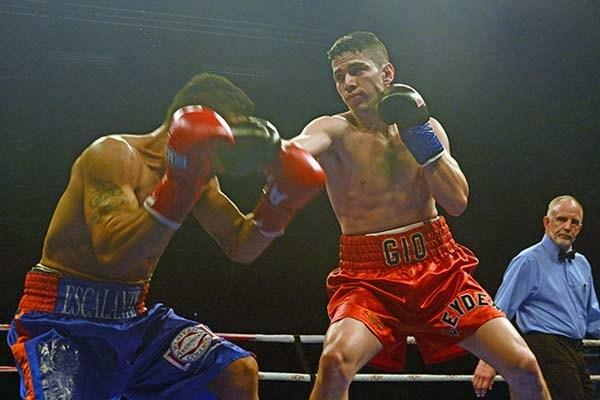 For Gio it is his fourth win this year and ups his record to 13 – 0 with 4 KOs. Padilla drops to 16 – 8 – 1 with 10 wins by KO. I have enjoyed boxing for almost 60 years and I always enjoy a good fight. Recently, I watched the video of a bout that took place a few years ago. Felix Strum defended his WBA Super World Middleweight Title against Martin Murray. The fight took place in Mannheim, Germany on December 2, 2011. The ring announcer was Steve Corbo from Chicago, who did an outstanding job. Hall of Fame referee Stanley Christodoulou was the third man in the ring. This is as fine an exhibition of the sweet science as you will ever see. 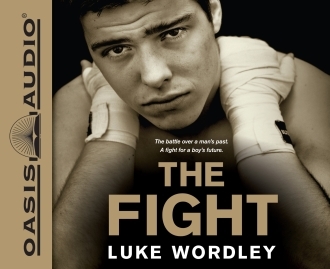 The fight was televised throughout the world, but it has never been televised in the USA. Please Note: due to programming, there is no sound for 67 seconds during the playing of the German National Anthem. The following article was written by Steve Corbo and is Reprinted here on dmboxing.com with permission of Fra Noi www.franoi.com Copyright 2017. 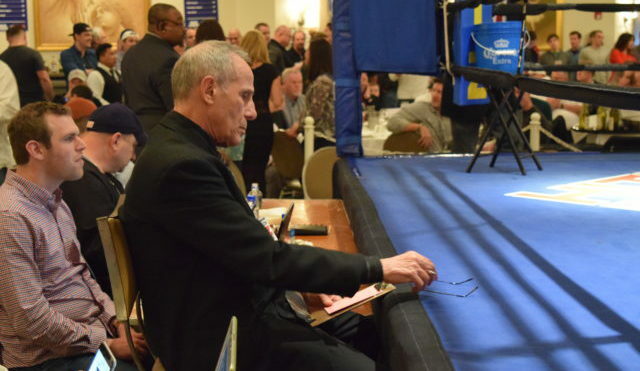 About The Author: Steve Corbo has more than 35 years in the boxing game. He has been a professional boxing judge; color commentator for televised boxing; and is a top ring announcer, especially in Europe, where he has announced major world championship title bouts. Harold Lederman, a Boxing Hall of Famer and member of HBO Boxing’s broadcast team, has called Corbo, “one of the best boxing ring announcers in the entire world.” A Chicago native, he has also been heard as the backup PA announcer for the Chicago Blackhawks. He is a graduate of the University of Southern California. Ladies and gentlemen, introducing one of professional boxing’s most respected stars outside of the ring. 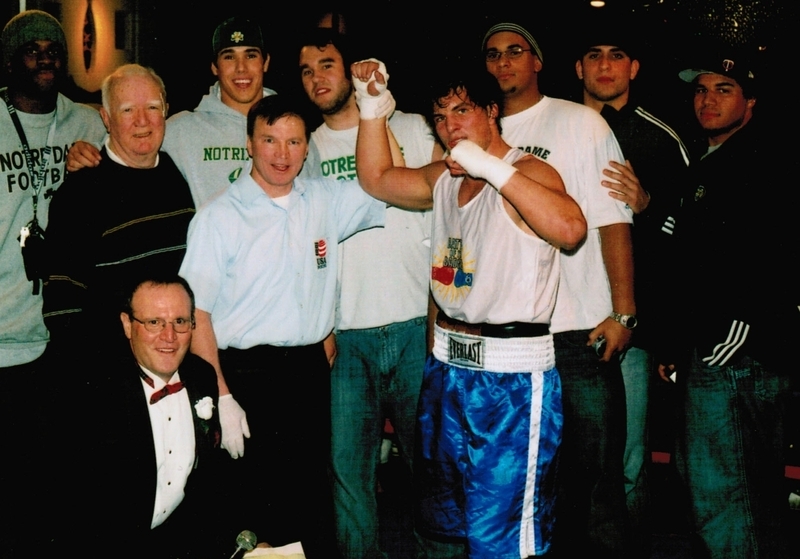 From Chicago, the only Italian-American professional boxing judge in the state of Illinois, always in the neutral corner, is Mauro DiFiore. DiFiore never steps into the ring and he must always maintain strict neutrality. His skills and 50 years of boxing experience have made him one of the most sought after professional boxing judges in the world. His reputation as one of the best has brought him to a level few ever attain. The globetrotting DiFiore has judged championship matches all over the world. He has appeared on HBO, Showtime, ESPN and several international networks where he has been seen by millions of fight fans.